Moon is the factor of mind and it affects mind. When Moon is corrupt then it creates mental problem. 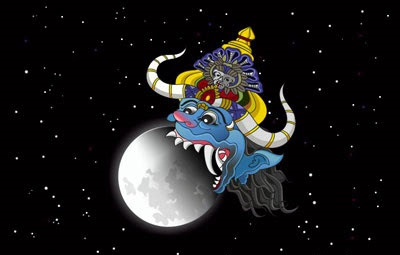 Rahu most contaminated the Moon. The combination of Rahu and Moon purely creates grahan yoga. The combination of Rahu-Shani or Rahu-Ketu is not known as grahan yoga. In horoscope, grahan yoga creates problem. Mind: A person faces mental problems. A person also face imagination problem. A person complains about black magic. Sometime, he cannot get sleep. Avoid alcohol and spicy food. Daily chant Gayatri psalm for 108 times in morning. Wear silver ring in right hand’s thumb on Monday night. Marital Life: The marital life becomes hell due to grahan yoga. There would be problems without any reason. This also creates doubt between spouses. Sometime, there might be condition of extra marital affairs. In this case, regularly worship Shiva-Parvati in the home. Also, make kheer on Monday. Do not stay in too much marble or stone house. Health: A person faces bizarre diseases due to grahan yoga. There would be symptom of diseases but one does not get disease. Usually, one cannot get reason and prevention of this disease. In this case, wear a piece of white sandalwood in blue color thread. Mix sandalwood in bathing water. Donate batasha on Saturday. Good Luck: Do not eat food on bed. Spouse cannot get time for each other. How To Save Yourself From Friends Negative Energy?